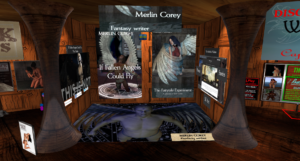 Today I decided to make an experiment : selling books in Second Life. Some people already did, but I couldn’t find anything looking successful enough, so I tried to imagine something different. I picked two high traffic malls with relevant themes : one in a rock club, the other in a dark fantasy roleplay area. Update 5/8 : I added a thrid shop, at the Gor Hub, a place dedicated to roleplay around John Norman’s work, and which is quite popular. 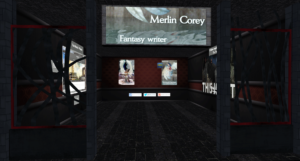 I hope Fantasy fans who play there will also like my stories. Final update : it was fun, but didn’t bring me any sales… Experiment discontinued.